This application’s goal is to help you get things done rapidly. And more to the point, PyroBatchFTP is an application you can use to automatically transfer files to and from FTP or SFTP servers. Set up a script and the application will run it; based on the script you select, it will transfer the data you select to or from the location you choose. PyroBatchFTP provides support for all Windows editions from Windows 9x and Windows ME all the way up to Windows 7 and Windows 8. It must be mentioned here that there are several PyroBatchFTP editions to choose from: PyroBatchFTP, PyroBatchFTP Server Edition, and PyroBatchFTP Standard Edition. Here on FindMySoft you can get the Standard version which is free to use for a trial period of 30 days. From top to bottom, you will see the following on the application’s interface: a traditional File Menu; a toolbar with buttons to execute a script, edit the script, access the Options menu, and open the Scheduler; a list of scripts. Since there’s nothing complicated about the interface, it should not take you long to figure it out. PyroBatchFTP is an automated internet FTP batch file transfer tool. Load a script, run it, and the application will batch download or upload data to/from a FTP or SFTP server. The scripts can be executed manually – click the Execute button, use the Alt + E hotkey that’s assigned to the Execute function, or use the F5 hotkey that will execute the script again. The scripts can also be executed automatically – you can use the Scheduler to run events based on a schedule. Be more efficient by letting PyroBatchFTP automatically transfer data to and from FTP or SFTP servers. Support for pretty much any Windows edition you can think of is provided. There are several PyroBatchFTP editions to choose from. The PyroBatchFTP interface is very easy to navigate. PyroBatchFTP can automatically transfer data to and from FTP and SFTP servers. 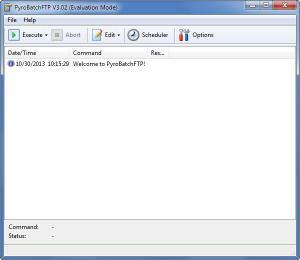 You can download PyroBatchFTP free here.